Future Thieves promotional still. Photo provided. 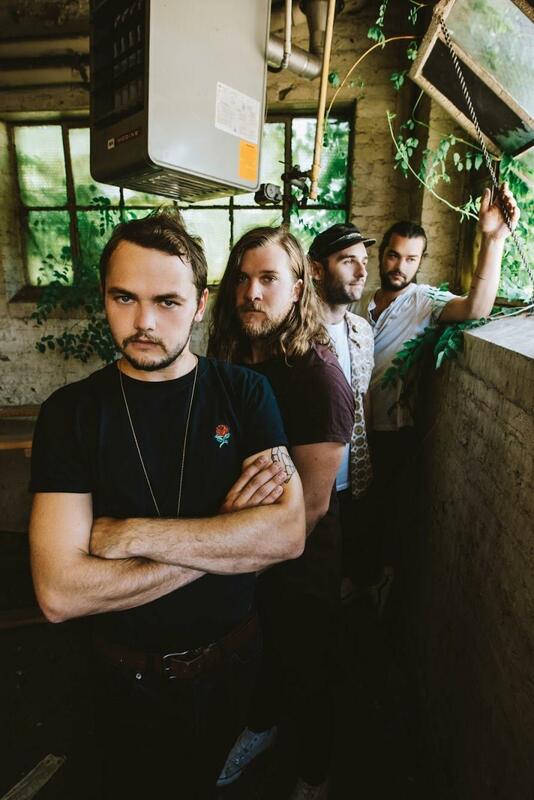 Future Thieves, an alternative rock band from Nashville, shared insight on their upcoming album set for release in 2018, before their live set at LouFest Music Festival this weekend in St. Louis. The Americana rock band delivers catchy hooks, and rhythms that stick to listeners like humidity in the middle of summer. Luckily, the band is set to share their music in picture perfect weather this Sunday. Austin McCool, goes over plans for Future Thieves in this brief interview. Q. The band has performed the new song ‘Sucker’ in a live setting. Will the band be sharing additional new music during their live set from 12:00 – 12:45 on Sunday, September 10? A. Hey there! We’ve been playing “Sucker” for a little less than a year now. The song has taken on a nice new feeling live, and we love it. Almost all of what we play now is new music that will be released on the new record due out in early 2018. We’ll play more than half the new record at Loufest, and we can’t wait for everyone to hear it. Q. How would you describe the recording process for the new album in comparison to your first studio album? A. We approached this record a lot differently than the first actually. We broke away from the idea that this band needs to be drums, bass, two guitars, and vocals, and just kind of did whatever we wanted. We hunkered down at Sonic Ranch in Tornillo, TX, and just made what sounded good to us. We finished it here in Nashville at a makeshift studio at Elliot’s house. It really helped us to explore the various sounds we wanted. Q. Is there a section of Nashville that gravitates to your music more than others? Does your music crossover well with the traditional country fans in Nashville? A. Despite what most people think, Nashville is not just a country city. There are so many unbelievable rock, indie, alternative, whatever bands here. It’s a close-knit community that supports all the different sounds people are coming to the scene with. I’d say we do well here. Good music is good music, and the people of Nashville are offered a lot of it. Q. When you were growing up, did you ever use a tape recorder to record songs off the radio? If so, which songs would you record? I had a conversation with a friend recently, and we both realized no one taught us that skill, we just did it out of love for a song. A. Man. I used to make a ton of mixtapes for myself. I can remember growing up and making a ton of mixes with everything from Jack Johnson and Dave Matthews to Queen and Led Zep to new (at the time) stuff like The Hives and Hot Hot Heat. I never took guitar lessons or anything, so making physical copies of these songs to listen to over and over again taught me how the guitar works. I hope kids are still doing that, and it’s not a lost art. Over the summer the band performed on the East Coast. How did those shows go? A. We love the East Coast. That’s probably our most played area of the country. New York is always so, so good to us. We love getting into that portion and doing our thing. Seeing repeat customers is dynamite for us. Q. What about LouFest attracts the band? A. The LouFest bill has been upgrading every single year, and I’ve been paying attention to it. St. Louis is such a great spot for music. The gateway and all that I guess. We just couldn’t be happier to be playing with such great bands in a city we truly love. I’d say go Blues and Rams, but the Blues make me sad, and the Rams are gone. Go Cards! Q. Your live shows sound like they contain high energy. With an early stage time on Sunday at LouFest; what kind of energy does the band plan to produce on stage? A. We’re just going to do what we always do. I hope the sun is shining and people get to see the sweat on our brows as we lay it all out there. Q. Is there any other topics you would like to cover that I might have missed? A. We have a new record coming out in early 2018, but follow us on Instagram (@futurethievesmusic) and like us on Facebook in the interim for some fun stuff leading to the record release. Thank you guys! Love! Preview their latest track ‘Sucker’ on YouTube, and catch Future Thieves live at LouFest this Sunday.